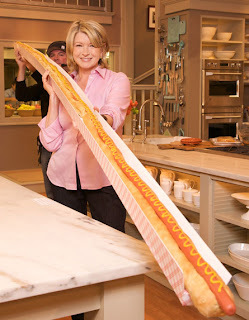 Martha Stewart opened her show sometime last week with this 15-foot long hotdog. The first thing out of her mouth was, "They say that length doesn't matter, but I disagree, especially when it comes to wieners." Martha, my dear! I nearly fell off of my chair! That Martha sure can be naughty sometimes. What's that old saying about being a gourmet chef in the kitchen, a housekeeper in the living room, and a tiger in the bedroom? Something like that. Anyways, this post does pertain to something retro, if you'll bear with me. Since the whole show was devoted to hotdogs, she brought out vintage collector Charles Phoenix sporting his "hotdog suit" and cool looking "Astro Weenie Pineapple" party display, made of marischino cherries, pineapple, and cocktail weiners. 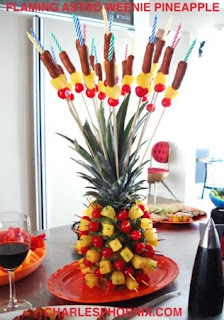 Martha marvelled at how retro it was, and you have the option of inserting birthday candles in the weiners and firing them up. I could make a joke here about flaming weenies, but I'm keeping it clean. Charles then showed several vintage hotdog related photos from the 50s and 60s. He actually has a pretty cool site full of retro pictures down memory lane, so check it out sometime. oooh that pineapple food sculpture looks like something out of a family circle magazine from the 1960's or 1950s.